OM! HAVING BOWED down to Narayana, and Nara, the foremost of male beings,and unto the goddess Saraswati, must the word Jaya be uttered. Bhimasena said, “Thy understanding, O king, has become blind to thetruth, like that of a foolish and unintelligent reciter of the Veda inconsequence of his repeated recitation of those scriptures. “Yudhisthira said, ‘I wish to know, O royal sage, whether any fault isincurred by one who from interested or disinterested friendship impartsinstructions unto a person belonging to a low order of birth! Ograndsire, I desire to hear this, expounded to me in detail. “The sage said, ‘If, on the other hand, O Kshatriya, thou thinkest thatthou hast any prowess still, I shall discourse to thee about that line ofpolicy which thou mayst adopt for recovering thy kingdom. “The king said, ‘I do not desire, O Brahmana, to support life by deceitor fraud. I do not desire wealth, however great, which is to be earned byunrighteous means. “Yudhishthira said, ‘Thou hast, O scorcher of foes, described the courseof duties, the general conduct, the means of livelihood, with theirresults, of Brahmanas and Kshatriyas and Vaisyas and Sudras. “Yudhishthira said, ‘How, O Bharata, should a person act who desires toadhere to virtue? O bull of Bharata’s race, possessed as thou art oflearning, tell me this, questioned by me. “Arjuna said, ‘In this connection an old history is cited, viz., thediscourse between certain ascetics and Sakra, O bull of Bharata’s race! “Yudhishthira said, ‘O grandsire, O thou that art possessed of greatwisdom, I have one great doubt that perplexes me. “Bhishma said, ‘In this connection is cited the following history ofolden times. “Bhishma said, ‘The dog transformed into a tiger, gratified with theflesh of slain beasts, slept at his ease. “Bhishma said, ‘Having once more assumed his proper form, the dog becamevery cheerless. The Rishi, reproving him, drove the sinful creature fromhis hermitage. “Bhishma said, ‘That king who, guided by the lesson to be drawn from thestory of the dog, appoints his servants to offices for which each is fit,succeeds in enjoying the happiness that is attached to sovereignty. “Yudhishthira said, ‘Thou hast, O Bharata, discoursed upon the manyduties of king-craft that were observed and laid down in days of old bypersons of ancient times conversant with kingly duties. “Yudhishthira said, ‘O grandsire, thou hast now finished thy discourseupon the duties of kings. From what thou hast said it seems thatChastisement occupies a high position and is the lord of everything foreverything depends upon Chastisement. “Bhishma said, ‘In this connection is cited the old story that follows.There was among the Angas a king of great splendour, called Vasuhoma. “Yudhishthira said, ‘Thou hast said, O grandsire, that behaviour is thefirst (of requisites for a man). Whence, however, does Hope arise? Tellme what it is. This great doubt has taken possession of my mind. “Bhishma said, ‘The king, having entered that large forest, came upon anasylum of ascetics. “The king said, ‘I am a king called by the name of Viradyumna. My famehas spread in all directions. My son Bhuridyumna hath been lost. “Yudhishthira said, ‘Like one that drinks nectar I am never satiated withlistening to thee as thou speakest. As a person possessing a knowledge ofself is never satiated with meditation, even so I am never satiated withhearing thee. “Sahadeva said, ‘By casting off all external objects only, O Bharata, onedoes not attain to success. By casting off even mental attachments, theattainment of success is doubtful. “Yudhishthira said, ‘What course of conduct should be adopted by a kingshorn of friends, having many enemies, possessed of an exhaustedtreasury, and destitute of troops, O Bharata! “Yudhishthira said, ‘What, besides this, should be done by a king that isweak and procrastinating, that does not engage in battle from anxiety forthe lives of his friends, that is always under the influence of fear, andthat cannot keep his counsels secret? “Bhishma said, ‘In this connection, persons acquainted with thescriptures declare this text in respect of duty, viz., for a Kshatriyapossessed of intelligence and knowledge, (the earning of) religious meritand (the acquisition of) wealth, constitute his obvious duties. “Bhishma said, ‘In this connection is cited the old story of a robber whohaving in this would been observant of restraints did not meet withdestruction in the next. 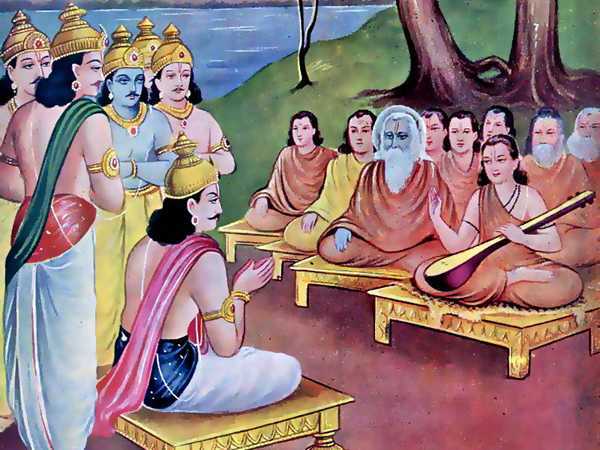 “Bhishma said, ‘In this connection, viz., the method by which a kingshould fill his treasury, persons acquainted with the scriptures of oldendays cite the following verses sung by Brahman himself. “Bhishma said, ‘These two, viz., one that provides for the future, andone possessed of presence of mind, always enjoy happiness. “Yudhishthira said, ‘Thou hast, O bull of Bharata’s race, said that thatintelligence which provides against the future, as well as that which canmeet present emergencies, is everywhere superior, while procrastinationbrings about destruction. “Yudhishthira said, ‘Thou hast laid it down, O mighty one, that no trustshould be placed upon foes. But how would the king maintain himself if hewere not to trust anybody? From trust, O king, thou hast said, greatdanger arises to kings. “Bhishma said, ‘In one of the branches of that tree, a pigeon withbeautiful feathers, O king, lived for many years with his family. Thatmorning his wife had gone out in search of food but had not yet returned. “Bhishma said, ‘Hearing these words fraught with morality and reason thatwere spoken by his wife, the pigeon became filled with great delight andhis eyes were bathed in tears of joy. “Bhishma said, ‘The fowler, seeing the pigeon fall into the fire, becamefilled with compassion and once more said, ‘Alas, cruel and senselessthat I am, what have I done! “Bhishma said, ‘After the fowler had left that spot, the she-pigeon,remembering her husband and afflicted with grief on his account, weptcopiously and indulged in these lamentations, ‘I cannot, O dear lord,recollect a single instance of thy having done me an injury! “Bhishma said, ‘The fowler, O king, happened to see that pair whileseated on their celestial car. Beholding the couple he became filled withsorrow (at the thought of his own misfortune) and began to reflect uponthe means of obtaining the same end. Vaisampayana said, “Hearing these words of Yajnasena’s daughter, Arjunaonce more spoke, showing proper regard for his mighty-armed eldestbrother of unfading glory. “Bhishma said, ‘Thus addressed, Janamejaya replied unto the sage, saying,’Thou rebukest one that deserves to be rebuked. “Saunaka said, ‘I shall for these reasons discourse to thee ofrighteousness, to thee whose heart has been exceedingly agitated.Possessed of knowledge and great strength, and with a contented heart,thou seekest righteousness of thy own will. “Narada said, ‘Without doubt, O Salmali, the terrible and irresistiblegod of the wind always protects thee from friendliness or amity. “Bhishma said, ‘Having settled this in his mind, the Salmali. in sorrow,himself caused all his branches, principal and subsidiary, to be cut off. Vaisampayana said, “After the conclusion of Arjuna’s speech, Bhimasena ofgreat wrath and energy, mustering all his patience, said these words untohis eldest brother, ‘Thou art, O monarch, conversant with all duties. “Yudhishthira said, ‘O grandsire, O thou of virtuous soul, what, indeed,is said to be productive of great merit for a person attentivelyengaged in the study of the Vedas and desirous of acquiring virtue? “Bhishma said, ‘They that are possessed of knowledge say that everythinghas penance for its root. “Yudhishthira said, ‘I know what benevolence is, in consequence of myobservation of persons that are good. “Vaisampayana said, ‘When Bhishma, after having said this, became silent,Yudhishthira (and the others) returned home. “Yudhishthira said, ‘O grandsire, O thou that art possessed of greatwisdom, I shall ask thee a question. “Bhishma said, ‘After that night had passed away and that best ofBrahmanas had left the house, Gautama, issuing from his abode, began toproceed towards the sea, O Bharata! “Yudhishthira said, ‘Discontent, heedless attachment to earthly goods,the absence of tranquillity, might, folly, vanity, and anxiety,–affectedby these sins, O Bhima, thou covetest sovereignty. “Bhishma said, ‘Led into a spacious apartment, Gautama was introduced tothe king of the Rakshasas. “Bhishma said, ‘There, under that banian, for the protection of hisguest, the prince of birds had kindled and kept up a fire with high andblazing flames. On one side of the fire, the bird slept trustfully. “Bhishma said, ‘The Rakshasa king then caused a funeral pyre to be madefor that prince of cranes and adorned it with jewels and gems, andperfumes, and costly robes. “Bhishma continued, ‘In this connection is also cited the old narrativeof the verses sung by Janaka the ruler of the Videhas, who had attainedto tranquillity of soul. “Yudhishthira said, ‘Whence has this universe consisting of mobile andimmobile creatures been created? Whom does it go to when destruction setsin? “Bharadwaja said, ‘If it is the wind that keeps us alive, if it is thewind that causes us to move and exert, if it is the wind that causes usto breathe and to speak, then it seems that life is worth little. “Bhrigu said, ‘There is no destruction of the living creature, or of whatis given, or of our other acts. The creature that dies only goes intoanother form. The body along dissolves away. The living creature, thoughdepending upon the body, does not meet with destruction when the body isdestroyed. “Bhrigu said, ‘Brahman first created a few Brahmanas who came to becalled Prajapatis (lords of creation).